Kitco offers collectible 1/2 oz Terry Sawchuk Silver Coins made of fine .9999 silver bullion. This limited mintage coin is produced by the Royal Canadian Mint and is part of the NHL Original Six Goalie Silver Coin Series. The reverse design features a portrait of goaltending great Terry Sawchuk during his days of playing for the Detroit Red Wings in the NHL's Original Six era. Rendered with finely detailed engraving, the mask-less net-minder’s is in action as he keeps his gaze fixed on the puck beyond the reverse; he is crouched in his familiar stance, with arms and legs splayed out as he uses his remarkably fast reflexes to defend the net. With a $10 CAD legal tender face value and limited mintage of only 8,000 coins, the 1/2 oz Silver Terry Sawchuk Coin is an extraordinary hockey gift for fans who are truly passionate about their team, the game, and its history. Kitco offers this silver coin in an RCM branded Terry Sawchuk graphic case with a brown clam shell silver coin box. Buy these RCM 1/2 oz Silver Terry Sawchuk Coins online at Kitco today. The Royal Canadian Mint is a Canadian crown corporation that mints all of Canada's circulation and legal tender silver coins. Since it released Canada's first domestically produced coin in 1908, the Royal Canadian Mint has acquired a global reputation for silver bullion minting excellence. Today, the Mint's superior technical capabilities allow it to set new benchmarks in silver coin design and quality. Why buy Silver NHL Coins from Kitco? Kitco is a trusted leader in the silver bullion coin and physical precious metals industry. 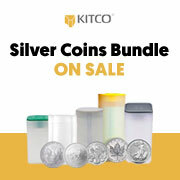 Silver bullion coins and other precious metals sold by Kitco are recognized in silver bullion markets around the world. With our focus on silver bullion coins, you can benefit from our low silver coin prices and premiums that are highly competitive in the industry. At Kitco, we make it easy for you to manage your wealth. You can sell or buy silver coins and other precious metals using our convenient online store, or by contacting our team of highly trained precious metals specialists. Backed by our global information network, Kitco has proudly served our customers since 1977.